If you are a lover of comfort food like I am, then you are going to love traditional Irish foods. These nostalgic foods fill the belly with warmth, embrace your heart with joy and just go down way too easy because they taste so darn good. As I sit and write, during a chilly day in February, with a snowy forecast in the future. I am basking in the delightful aroma coming from my oven as I am baking a batch of Irish soda bread, the perfect accompaniment to the Irish stew simmering on my stove-top. I take in as much as I can, attempting to savor the bouquet of these traditional Irish foods. As a decedent of an Irish Grandmother, I am fortunate to enjoy so many wonderful comfort foods from the Emerald Isle. And being married to a chef, only makes my grandmothers recipes even better. Here you will find recipes and a bit of history of some delicious traditional Irish foods, which I think you will enjoy. So sit back and relax and take it all in. Potatoes were an extremely important crop to the Irish and is a favorite food to them today. First crop which was domesticated by man and was found in North and South Americas. Earliest record of a potato dates back to 4th century AD, and came from a picture of a potato on an Inca ceramic piece. The Spanish brought the potato to Europe in 1570 and it reached the British Isles in 1590. Ireland used it as a staple food and it was widely accepted in 1663, a few years later it became known as the Irish potato. Dependence on this one crop and colder then usual climate causing potato blight is what led to the potato famines in the 1700's. Of all foods, the spud is the most traditional. They are consumed boiled, mashed fried or even chipped. 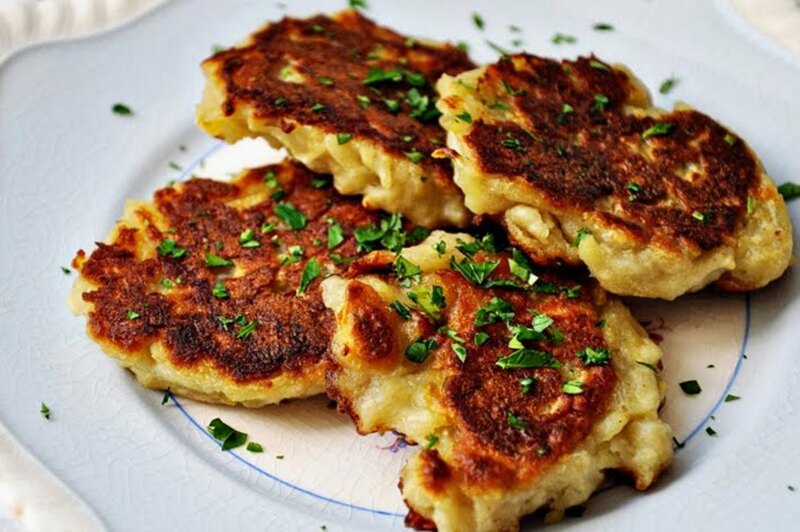 Mixed with cabbage or scallions to make Colcannon or Champ or even made into pancakes, also known as Boxty. Potatoes are added to stews, soups and on top of pies. The Irish are quite fussy about their potatoes and have reason to be. Since they are the potato experts. If a magpie comes chattering at your window sill it is a sign of death. There are so many traditional variations of Irish soda bread it can get a bit confusing as to which ones are actually Irish. 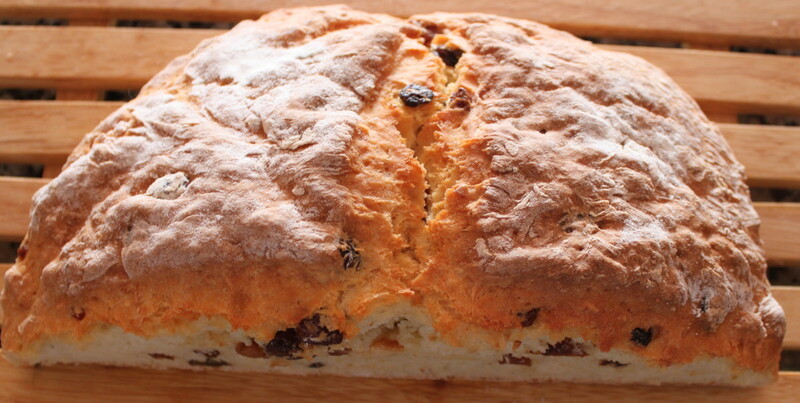 However many people think of irish soda bread as white, which would have been more of a luxury to the Irish. 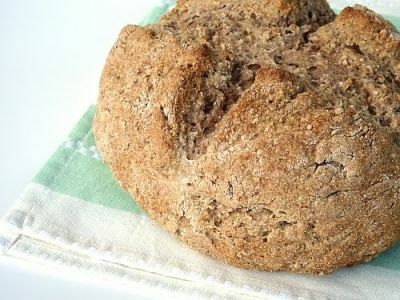 Traditionally, brown soda bread is what was served, made with whole meal flour. 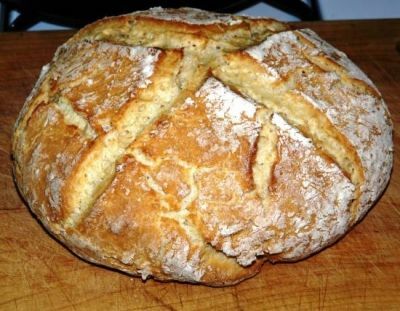 Soda bread is a basic table bread, served with any meal like a nice Irish Stew. The introduction of bread soda (baking soda) in the early 1800's enabled people to make bread without the use of an oven. Since an oven in these days was basically non-existent, bread soda was a break through. Now, everyone could make bread. All they needed was some wonderful bread soda, buttermilk from their cows, and flour from the grains which they grew in their fields. The bread was cooked in a bastible, which is a big cast-iron pot with a lid placed right onto the open coals. There are so many variations to this bread but the true Irish soda bread would have been brown and plain. Adding dried fruit to this bread would not have happened since these fruits would have been a luxury item. It has been reported that some regions of Ireland used seeds in their breads and this custom may have been taken with them to America. No matter how Irish Soda Bread is made, it's very tasty and super easy. Mix the dry ingredients in a bowl. Make a well in the center and add 1 3/4 cups of buttermilk and the beaten egg. Stir from the outside of the bowl, mixing inward to blend together. The dough should be soft, but not sticky. Add more buttermilk if necessary or a little more flour if it seems too moist. When all is blended, put onto a floured board or countertop. Knead very lightly until all is smoothed over. This only takes a few seconds. Pat into a round loaf about 2" high. Cut a cross pattern all the way along the top. Place on a lightly greased baking sheet and bake in the preheated oven for 35 to 40 minutes. Test for doneness by tapping on the bottom of the loaf. If it sounds hollow it's done. WARNING... Do not over knead the dough, this will cause the dough to be tough. Make a well in the center and add 1 1/2 cups of buttermilk. Stir from the outside of the bowl, mixing inward to blend together. The dough should be soft, but not sticky. Add more buttermilk if necessary. When all is blended, put onto a floured board or countertop. Knead very lightly until all is smoothed over. This only takes a few seconds. Pat into a round loaf about 2" high. Cut a cross pattern all the way along the top. Place on a lightly greased baking sheet and bake in the preheated oven for 15 minutes. Then turn it down to 400 degrees and bake for 20 to 30 minutes longer. Cool on a wire rack. If you don't like your bread so crusty, wrap it in a towel while cooling. Eating five meals of nettle before the 1st of May cleans the blood. It is a weed which grows abundantly all over the world. Also known as stinging nettle, the stems and leaves are covered in tiny, needle-like hairs that will give you a nasty rash if you touch them with bare skin. This weed is edible and has quite a few health benefits. I have included a book about edible weeds, if you would like to know more about this wonder weed and others. At one time in Ireland, using nettles in food was quite common, especially during those times when food was scarce. An interesting point about this nasty weed "nettle" is that it is full of essential vitamins and minerals. Packed with minerals like calcium, magnesium and iron, as well as vitamins A and C. To top things off, nettle is totally free and most likely available right in your own back yard. 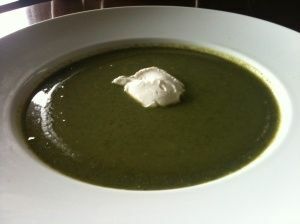 Nettle soup is not commonly eaten today, however there is no denying how healthy this evil weed is. Don't be surprised when you see it on a healthy restaurants menu. Unless you enjoy pain, you will need to wear a good pair of gloves when collecting your nettle. Look for younger plants, they will taste better and are more tender. A younger plant can be identified by having brighter green leaves. 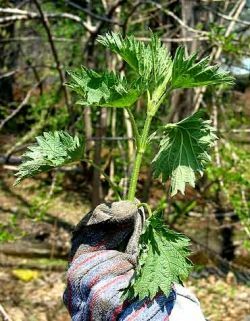 Just fill up one of those plastic grocery store bags with the bright green nettle tops. F.Y.I The sting of the nettle will disappear during the first few minutes of boiling. Melt 1 Tbsp butter in a large stockpot. Sweat onion in butter until translucent, about 5 minutes. Add potatoes and 6 quarts stock, stir to incorporate. Bring to a boil, then let simmer until potatoes are tender, about 20 minutes. Stir in nettle leaves and cook 3-4 minutes more. Puree very well in a blender or with an immersion blender, adding more stock if needed to adjust thickness. If texture is still too fibrous, push through a fine sieve. Serve hot. 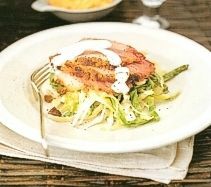 Optionally, garnish with a dollop of creme fraiche or plain yogurt. 1 cup whipping cream, 2 tablespoons buttermilk, Combine 1 cup whipping cream and 2 tablespoons buttermilk in a glass container. Cover and let stand at room temperature (about 70Â°F) from 8 to 24 hours, or until very thick. Recipe adapted from Blue Ridge Restaurant's "Stinging Nettle Soup"
Edible Wild Plants provides what you really need to know to have your own wild food adventures. Author John Kallas gives you unprecedented details, maps, simple explanations, and multiple close-up photographs of every plant covered at every important stage of growth. 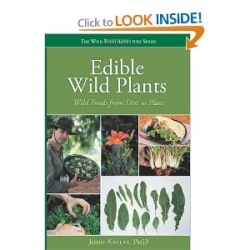 This beautiful, glossy book has the sharpest edible wild plant photos available. If you didn't recognize these plants before, you will now. The author focuses on the best parts of the plants to use, and even recipes. I recommend this book to anyone who really wants to feel better about their health,Have a relationship with the earth,and a backyard buffet! Survival at your doorstep makes for a confident forager! If you spill salt, you must throw some over your left shoulder to stave off bad luck. A traditional Irish potato pancake. 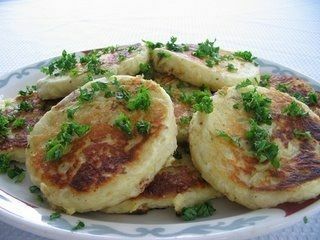 The most popular type of boxty consists of finely grated, raw potato and mashed potato with flour, baking soda, buttermilk and sometimes egg. The mixture is fried on a griddle for a few minutes on each side, similar to a normal pancake. 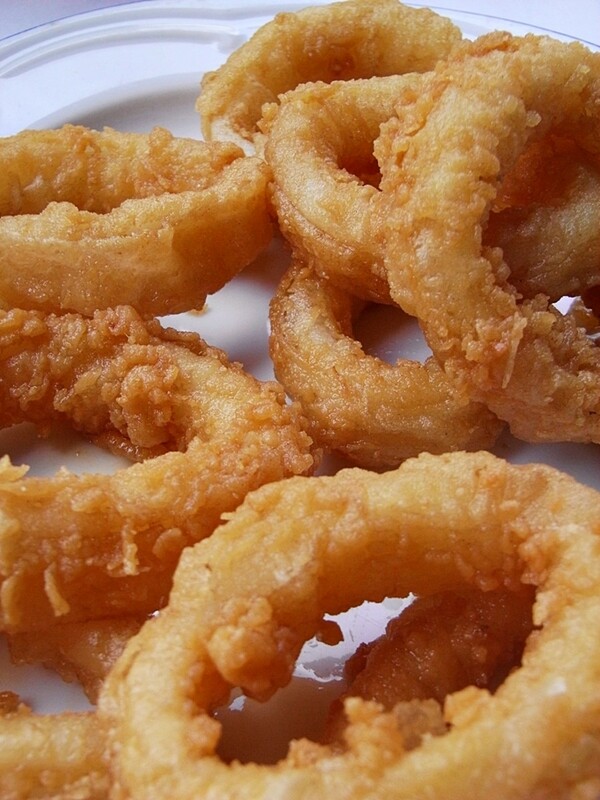 They can also be found in restaurants with various toppings and stuffings. The most noticeable difference between boxty and other fried potato dishes is its smooth, fine grained consistency. 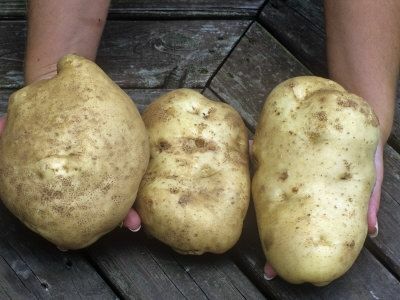 The Irish were the first to call potatoes "spuds". The name is from a type of shovel used to dig up potato hills. Peel the cooked potatoes while they are still hot, drop into a bowl and mash immediately. Grate the raw potatoes, add to the mashed potatoes with the flour and sifted baking powder. Mix well, and add enough buttermilk to make a stiff batter. Heat a frying pan, grease with butter and cook large or small pancakes in the usual way. Eat them straight from the pan with butter, crispy rashers or pure Irish honey. As you may know already, corned beef and cabbage was not a traditional Irish food. It is however a traditional American-Irish Food. The Irish version is known as bacon and cabbage. The bacon is not the typical cut we find in America, also known as back bacon. This is a lot leaner than American bacon and is more similar to Canadian bacon. Until about the middle of the 20th century, people living in Ireland would never have been able to obtain corned beef. Beef was primarily eaten by the wealthy. Today, corned beef is widely available in Ireland, but bacon and cabbage are still much more popular. It's a regular meal in an Irish home, and can be found on many restaurants or pubs menus. You may see corned beef and cabbage on irish pub's lunch menu, but this is mainly for the tourists who expect to see it there. Place meat in a large saucepan of water and bring to a boil. If a white foam forms on the top, drain off the water and replace with cold water and bring to a boil again. The foam is salt and you need to repeat until no foam forms on the top. Add the vegetables and simmer for 1 hour and 15 minutes. Once the meat is cooked remove it from the water and dry it. If there is a coating of thick fat, it can be cut off. Retain 1 cup of cooking water and discard the vegetables. Mix the honey and mustard and cloves together and rub over the bacon. Cover and refrigerate over night. Before serving, put the bacon in the oven at about 400 degrees for about 20 to 30 minutes. Remove outer leaves of the cabbage and discard. Cut into fours and remove the stalk. Then finely shred it. Put half of the cupful of bacon water you saved into the saucepan, add the butter and bring to a boil. Add the cabbage to the boiling water and stir constantly until it wilts and becomes soft. It only takes about 5 minutes to cook. The water and butter will disappear so there is no need to drain. Serve with Champ or Mashed Potatoes. I love stews! There are so many recipes for Irish stew and they are all slightly different. The great thing about stews; there is no wrong way to make it. Cook it in the oven or on the stove, use lamb or beef, parsnips or carrots, onions or leeks, its all up to you and your taste and what you have on hand. I believe a true Irish Stew should contain potatoes or it really isn't irish. However, many Irish Stews do not contain potatoes. The traditional meat for an Irish stew is lamb. However, if you prefer you can substitute beef. Preheat oven to 275Â° F.
Trim the meat into about 1" cubes leaving on a little of the fat. Peel and slice the potatoes 1/4" thick. Do the same with the onions. Now take a large oven proof pot or casserole with a cover, about 6 quart size. Place a layer of potatoes in the bottom of the pan, leave enough for a final top layer of potatoes. Lightly season this layer and the following layers with salt, pepper and thyme. Then add the layer of the lamb and season. Add the layer of onions and season. Finish off with a top layer of potatoes and season. Add the water and cover. Put in the oven for about 2-1/2 hours. The pan should be shaken once in a while to keep the potatoes on the bottom from sticking. You should also check to be sure the liquid hasn't dried out. When done the liquid should be slightly thickened by the potatoes. If you'd like you could brown it in the broiler before serving and sprinkle some fresh parsley on top before serving. How about a nice Guinness Stew, it just doesn't get any more Irish than that. Your can read about it here. Enjoy! You must never build a house on the site of a Fairy Fort for it will bring you eternal bad luck. 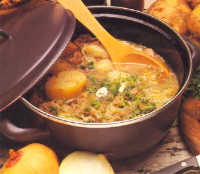 Coddle is a dish associated with Dublin and is commonly referred to as Dublin Cobble. It consists of layers of sliced pork sausages and rashers (bacon) with sliced potatoes, and onions. A very simple dish and the with the only seasoning usually being salt and pepper and little parsley. 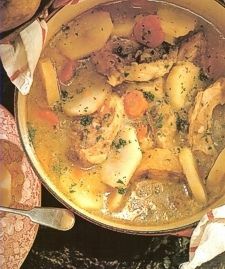 Coddle is considered a comfort food in Ireland, quite inexpensive and easy to prepare. It is often eaten in the winter months and is an alternative to an Irish stew. It has been said to cure hangovers and other ailments. Put the bacon in a skillet over medium heat. Fry for 10 minutes or until very crisp. Remove the bacon to a piece of paper towel to drain. Remove all but 1 tablespoon of the bacon drippings from the pan and discard. Place the sausage links into the skillet with the reserved drippings. Brown the sausage 8 minutes, turning often to brown all sides. 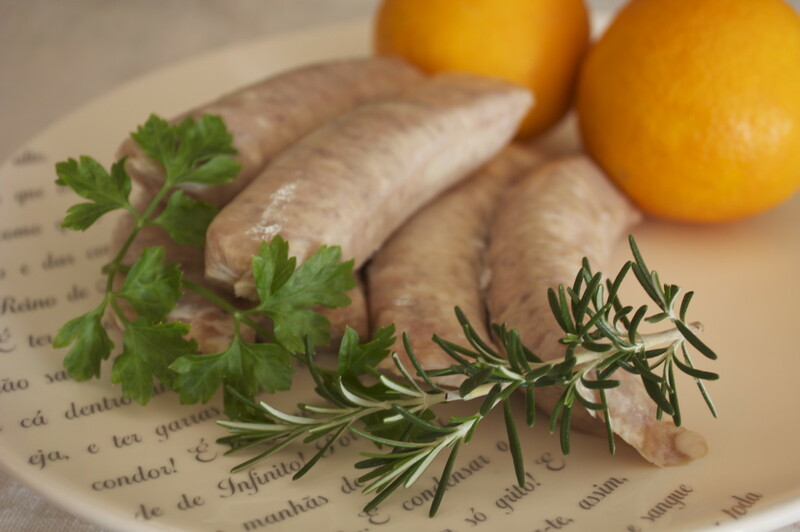 Remove the sausage and drain on a paper towel. Place the onion and garlic cloves into the drippings in the skillet. Turn heat to medium low and cook for 5 minutes, or until just beginning to soften. Crumble the bacon into the bottom of a large soup kettle. Place the cooked sausage into the pot with the bacon. Add the softened onions and garlic cloves. Place the potatoes and carrots into the kettle. Sprinkle salt and pepper over all ingredients. Pour enough of the apple cider over the mixture in the pot to just cover. Cover and cook over medium low heat for 1 1/2 hours. Sprinkle the parsley over the soup just before serving. Makes about 6 servings.Put the bacon in a skillet over medium heat. Fry for 10 minutes or until very crisp. Remove the bacon to a piece of paper towel to drain. If there is one truly Irish dish, this is it. Colcannon is a true comfort food made primarily from mashed potatoes and cabbage, sometimes kale, and butter, salt, and pepper. It can contain other ingredients such as milk, leeks, onions, garlic, boiled ham or rashers. 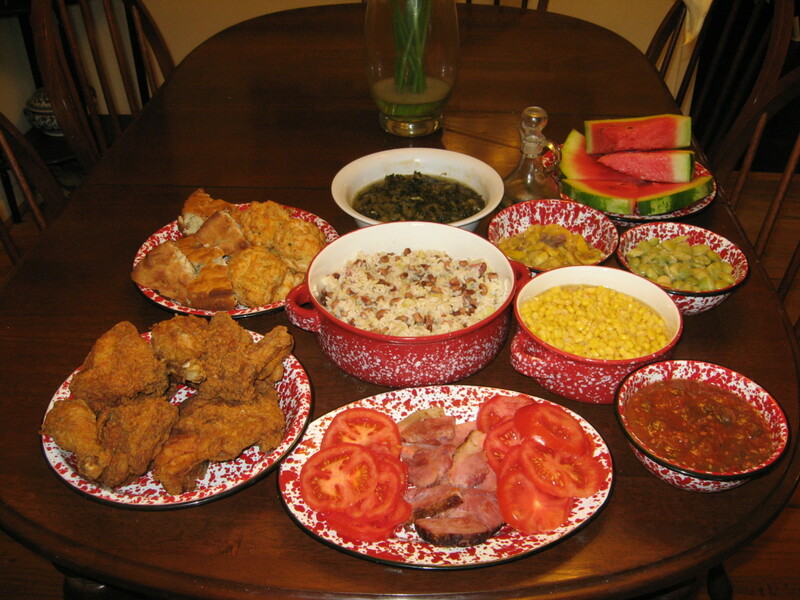 A very ordinary meal, and at one time it was a cheap, year-round staple food. 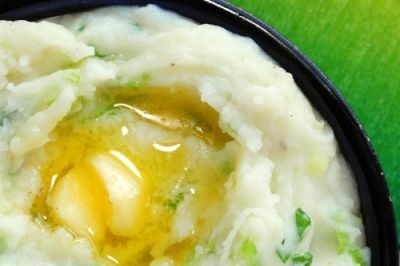 An old Irish Halloween tradition was to hide small coins inside colcannon prior to serving. 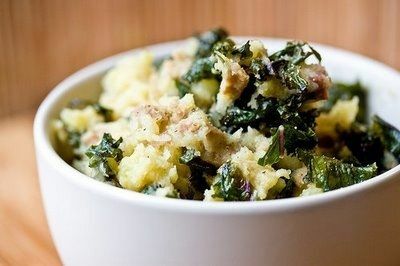 Colcannon is tasty and filling and super easy to make. An Irish favorite and even has a song about it. Remove the core from the cabbage and thinly slice, put into a large saucepan of boiling water. Keep it boiling at a slow boil for 3 to 5 minutes or until the cabbage is wilted and has turned darker. Don't let it over cooked, if anything it should be slightly undercooked. Drain the cabbage and return to saucepan. Add 1/3 of the butter and cover. Leave it covered and not on a burner for butter to melt. When the potatoes are soft, drain and return to saucepan and place on a low burner, leaving lid off for excess moisture to evaporate. Add milk to saucepan with potatoes, with 1/3 of butter and chopped scallions. Allow milk to warm but not boil, it is almost done if butter has melted and begins to meld in. Using a potato masher or a fork mash the potatoes thoroughly into the buttermilk mixture. Do not pass through a ricer or a mixer, because it will make the potatoes sticky and gluey. Mix the cabbage throughly with the mashed potatoes. Prior to serving season with a little salt and fresh parsley or chives. Don't forget to make a well in the center and put the last third of butter in the center and allow to melt. Enjoy! This All Clad 8/10 stainless steel aluminum core 12-Inch Fry pan is the perfect kitchen essential for a new homemaker as well as the well-seasoned cook and everyone in between. Lakeshore Wholegrain Mustards are prepared by hand in the traditional dijon manner, using the finest natural ingredients without artificial colorings, flavorings or preservatives. They are produced in the village of Ballinderry in small batches to retain the distinctive flavors that enhance all savory dishes, from sandwiches to steak. Whole Grain Mustard with Guinness is a unique blend of Guinness Stout and mustard that is excellent with roast beef, steaks, and barbecued meats. Adds subtle flavor to sauces, and zest to soups and casseroles. If you get your shirt wet while you're washing the dishes you will marry a drunk. Agreat food for a chilly day. Champ is one of those foods which warms your heart and soul. Butter is what makes this dish delicious. It is very similar to Colcannon, I guess you could say they are cousins. A great accompaniment to any meat. This is such an easy recipe it barely counts as a recipe at all. when the potatoes are done, drain and return to sauce pan. Place the sauce pan with the drained potatoes on a low burner to remove all moisture. Add milk to the sauce pan along with half of the butter. Continue cooking on low heat, milk should warm but should not boil and butter should be fully melted. Using a potato masher or a fork, mash the potatoes thoroughly with the butter and milk mixture. Do not use a ricer or a mixer because this will make the potatoes sticky and gluey. Prior to serving, make a well in the center of the potato add a nice sized pad of butter. Eat by dipping spoonfuls of potato into the melting butter. Yum!Enjoy! If you possess a four-leaf shamrock you will have good luck in gambling, good luck in racing, and witchcraft will have no power over you. But, you must always carry it on you. You cannot give it away. You cannot show it to anyone. Leeks have there place in Ireland and lucky for them since potatoes and leeks just go so well together. The Normans brought Leeks to Ireland in the 15th century. Scott's Irish Potatos are made with Real Butter and we make them 2 ways, with and without coconut. They are hand scooped and hand rolled in cinnamon. Cut the hard green part of leeks off and discard. Split the leeks lengthwise and wash to remove any dirt in cold water. Drain and pat dry. Cut a 2's piece off from one leek and set aside. Cut the remaining leeks into 1" pieces. Melt the butter in a saucepan over low-medium temperature and add the onions, leeks, celery, garlic and potato, stir to coat and continue cooking about 5 to 6 minutes. Pour the stock into the saucepan and bring to a boil, reduce heat and simmer for about 20-25 minutes. Pour into a blender and blend until smooth. Season to taste with salt and pepper. Slice the 2" leek very thinly with some chopped parsley and add them both to the soup. Simmer for 5 to 10 minutes.Enjoy! 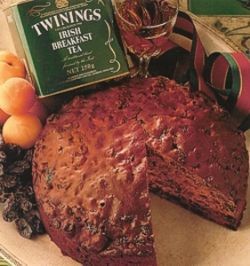 Barm Brack or Tea Brack is a a sort of cross between cake and bread traditionally eaten at Halloween. Yeast is used as a raising agent in barm brack, while tea brack rises with the aid of baking powder. While bracks bought in stores will use yeast as a rising agent, this version is closer to the original, using baking powder instead. It is very moist and delicious cake. 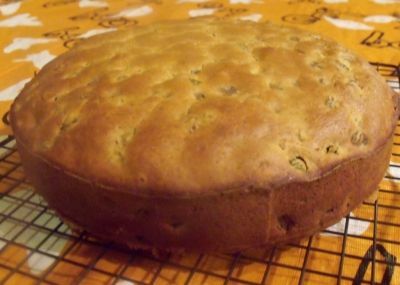 The word Brack comes from an old Irish word, 'breac', meaning speckled, which every piece of this cake is. Traditionally small trinkets are mixed into the brack before it is baked. Each one conveys a message or meaning for the beholder of the slice. The Here is a list of the trinkets and their meanings if you would be lucky enough to receive one. If you are using any of these items, wrap them well in wax paper before adding them to the mix. You will need a loaf pan or a deep round cake pan, spring pans work nicely. Round style is more traditional. Put the tea, sugar, lemon rind and dried fruit in a bowl. Stir well, then cover and leave to soak overnight. The next day, preheat the oven to 350ÂºF, grease the pan with a little butter. Beat the egg and mix it thoroughly with the fruit and marmalade. Sift the flour, spices and bread soda together and stir well into the fruit mixture. If adding charms...Push them into the batter, paying attention to evenly spacing them throughout the loaf. Bake for 90 minutes. Cool for 20 minutes in pan before placing on wire rack. Let cake cool completely.Enjoy! Lifelike shamrocks on wandering vines adorn Belleek's Shamrock tea pot. Basket weave-textured embossment produces a brilliant luster and a natural look and feel. A great way to bring the Irish countryside to the dining or living room, this elegant piece is crafted of fine Parian China-a material developed in Great Britain in the 1840s for sculpting classical figurines with crystalline translucence. A sturdy handle allows easy control of the pot for smooth pouring. The handle is hand-painted in varying shades of green, from lighter to darker, and is complemented by brown brush strokes to create an earthy appearance. Shepherd's pie is comfort food at it's finest, especially when it has a little Irish flavor thrown in. 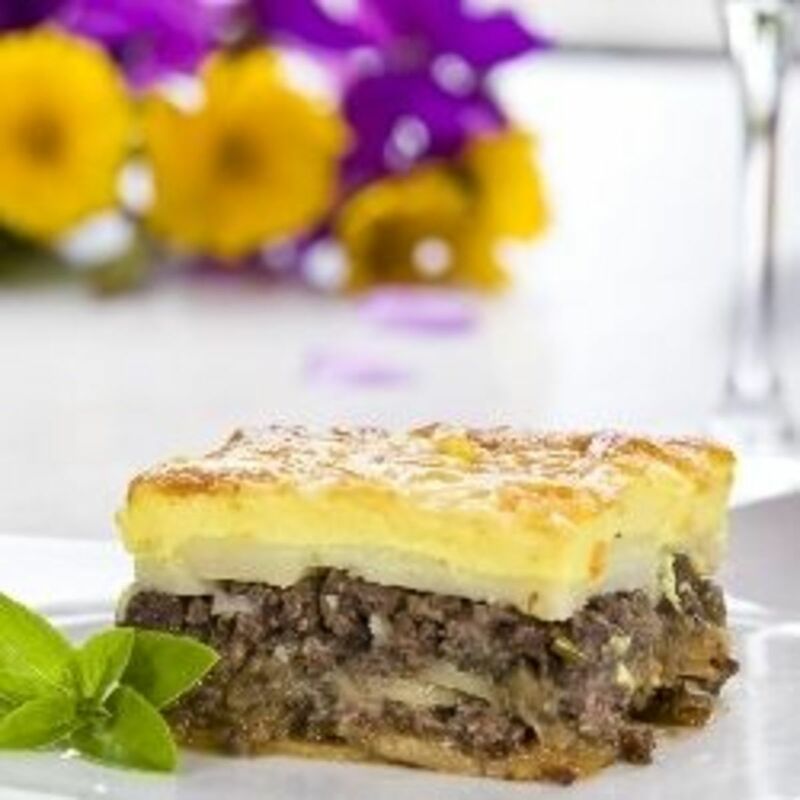 Shepherd's pie may have originated in England, but it was adopted by Irish people many years ago. 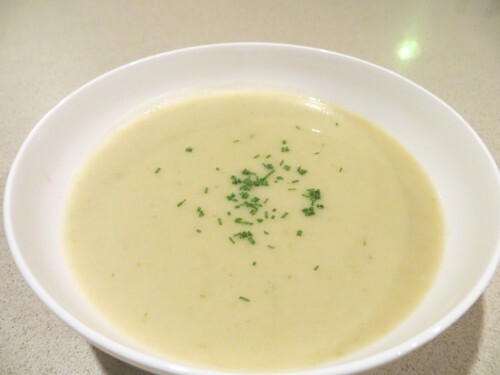 Potato and leek soup is a traditional Irish, wintertime, comfort food. Spotted dog is cross between bread and cake, and is usually eaten spread thickly with butter. It is also very nice toasted. Delicious dessert, rich and creamy. 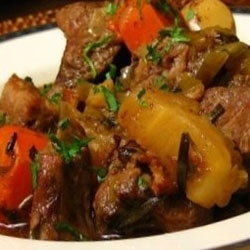 Easy Guinness Stew recipe. Great stew to make for a party or large gathering. Bring a piece of the Emerald Isle into your home with Belleek Tara Accent Bowl. The 6-inch Tara accent bowl by Belleek Pottery is made from white Parian china with hand painted shamrocks and Celtic designs. Imported from Ireland. You really do rock girl. I didn't expect all the Irish excitement that I discovered here. You captivated me. When I think Irish I think potatoes and Irish stew. I had completely forgot about the traditional soda bread and I had never heard the terms coddle or champ before. You enlightened me. great recipes! I'll be trying some of them. Fabulous lens! It appears we have something else in common, our Irish Grandmamas! *Squid Angel Blessed* and added to My Squid Angel Blessings 2012 in the "Holidays &amp; Celebrations Â» Saint Patrick's Day" neighborhood, rather than regional food. If you prefer I will change it to the food category. Just let me know. Great lens and superb collection of Irish recipes. Much appreciated. Appreciating this topic, among the best IRISH topics I have visited as prep for St Patricks Day Celebrations. Conversations helps with new ideas. Congrads on your Squidoo Trophy. Thanks. Yum! May I feature this on my Traditional Irish Breakfast lens? :) Blessed by a SquidAngel! Blimey ... but I am seriously all about that cabbage, you know? Erin go braugh. Thanks for recipes, great lens, and very Irish. Thanks for the wonderful recipes! I copied several of them to try out.